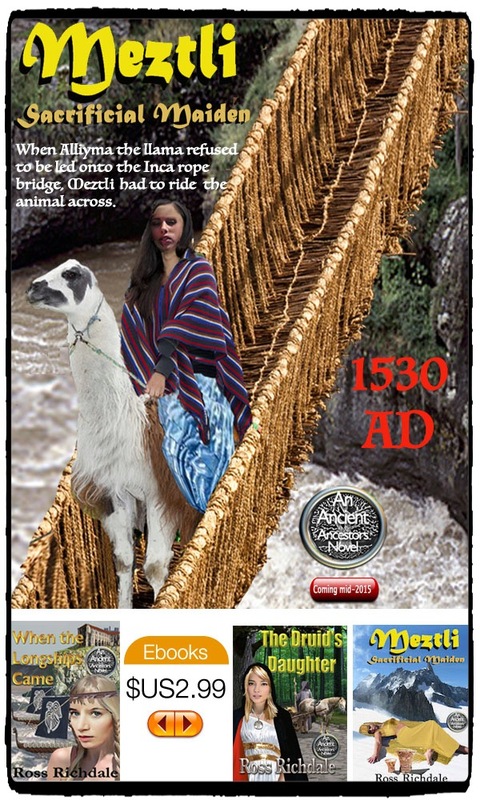 Our latest novel Meztli Sacrificial Maiden is set in the Inca Empire in 1530 and will be published mid-year 2015. Meztli and her friend Cualli are rescued by a young man, Zolin after being left to freeze to death on a mountain plateau as human sacrifices. However, they cannot return home and set out across the mountains to find a new home chased by an evil priest who is working for the conquistadors who have invaded Inca lands. This is the third Ancient Ancestors novel. The others, When the Longships Came , is set in the Viking times and The Druid’s Daughter set in Roman Britain. Both are available as ebooks at all the major outlets for $US2.99.